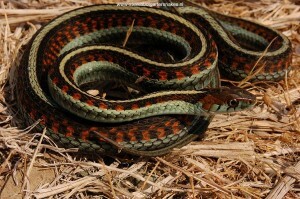 Male (59 cm) from Marin County.This subspecies of Thamnophis sirtalis is high ranking in the list of most beautiful and colorful garter snakes. This astonishing snake occurs in a narrow strip along (parts of) the Californian coast. 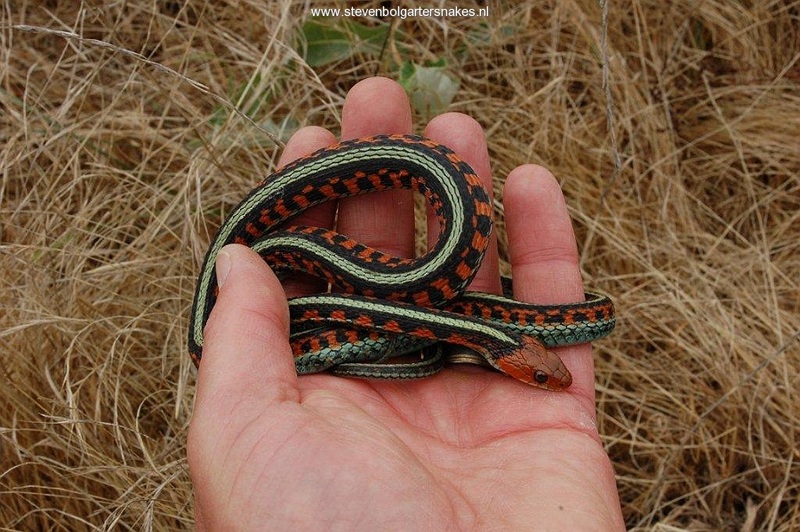 In California at least 3 subspecies of Thamnophis sirtalis occur: T.s.tetrataenia (the San Francisco Garter Snake), T.s.fitchi and T.s.infernalis. The exact ranges of the different subspecies of sirtalis on the west coast have been a point of discussion and without a doubt new facts will surface. 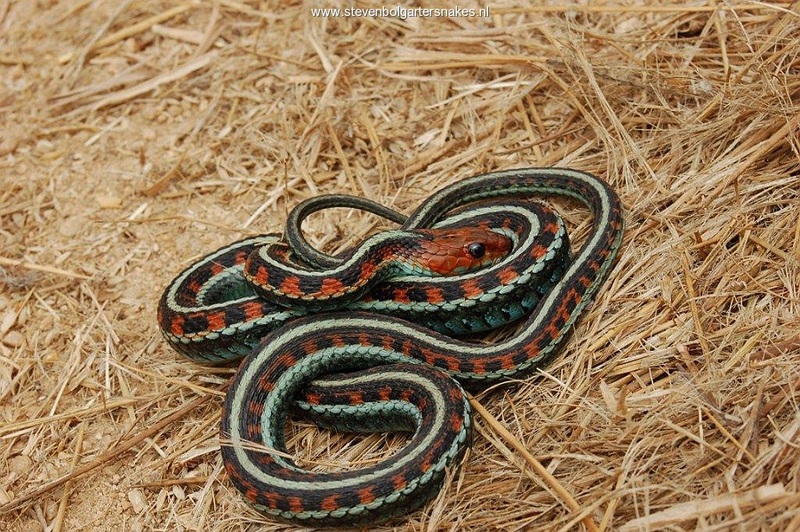 Around 1995 some new research caused some confusion since it was proposed that what is now known as the San Francisco Garter Snake should be named T.s.infernalis. The surrounding populations we now know as T.s.infernalis should be called T.s.concinnus. 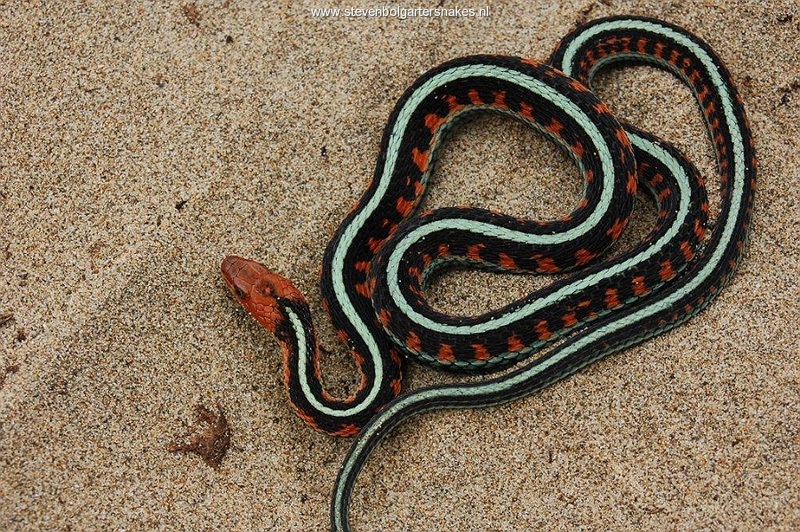 I am glad that within a few years the scientist decided that this caused too much confusion, so now the latin name of the San Francisco Garter Snake is T.s.tetrataenia and the one of the California Redsided Garter snake is T.s.infernalis. 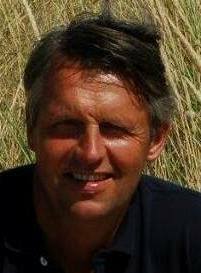 This subspecies has been shipped to Europe in very low amounts over the years and only in the past few years (approximately since 2004) captive bred offspring is limited available in Europe. 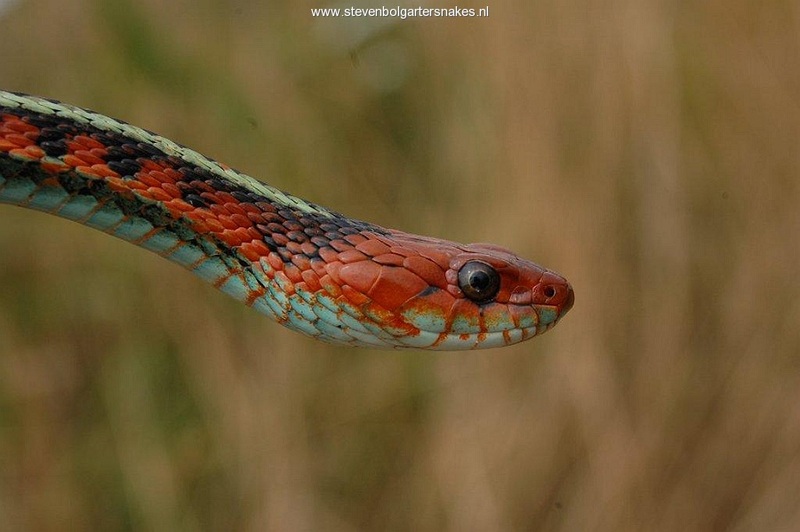 The snakes are relatively slender built. The females can easily reach the 90 – 100 cm. For males 65 – 75 cm is close to the observed maximum and they normally stay very slender. Maximum size for T.sirtalis is 137 cm (in literature). Female T.s.infernalis larger then 100 cm are very rare though. Male (60 cm) from Marin County. T.s.infernalis has 3 yellow or blue stripes. Between the stripes they have a red color with double row of black spots. In some specimens only the red blotches against the lateral stripe are prominent, but in some specimens the red occurs all the way to the dorsal stripe. The upper row of black spots can melt together and form a black stripe bordering the dorsal stripe, similar to the one in tetrataenia. T.s.tetrataenia and infernalis can be distinguished relatively easily however, since only in tetrataenia the red blotches form a red striped without being regularly interrupted by the black or dark blotches. In infernalis the blotches interrupt the red stripe all over the body. The head of infernalis is beautiful red on top. T.s.infernalis occurs over a wide range with relatively much variation in coloration and pattern. The amount of red and blue differs a lot. Together with T.s.tetrataenia this is clearly the subspecies of sirtalis with the highest amount of red. 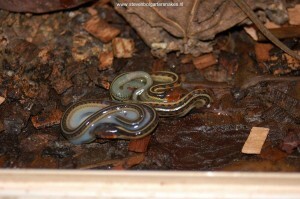 This diurnal snake is normally clearly visible in its terrarium as long as it is not too hot. Basking under the lamp on a branch or on the ground. Maximum temperature in the terrarium should be approximately 30 – 35 °C locally. In a dry terrarium with a water bowl they normally do well. My snakes are almost exclusively fed with (dead) fish supplemented with Vitamin B1. The newborn juveniles also accept worms. Normally it is not so difficult to get them used to (baby) mice. A hibernation of 2 – 4 months with low temperatures (4 – 8 °C) in a moist substrate are not a problem at all and the snakes seem to benefit from it. As a guideline for the minimum size of the terrarium to keep one adult couple I recommend 60 x 50 x 50 cm. Thamnophis sirtalis infernalis occurs north, south and east of the San Francisco peninsula which is the home of the San Francisco Garter Snake. Some populations or specimens are very similar to the San Francisco Garter Snake. 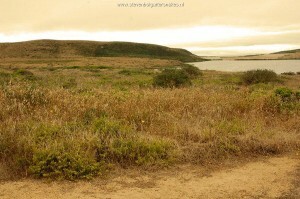 Under weblog I described some of my observations in the natural habitat in Marin County. 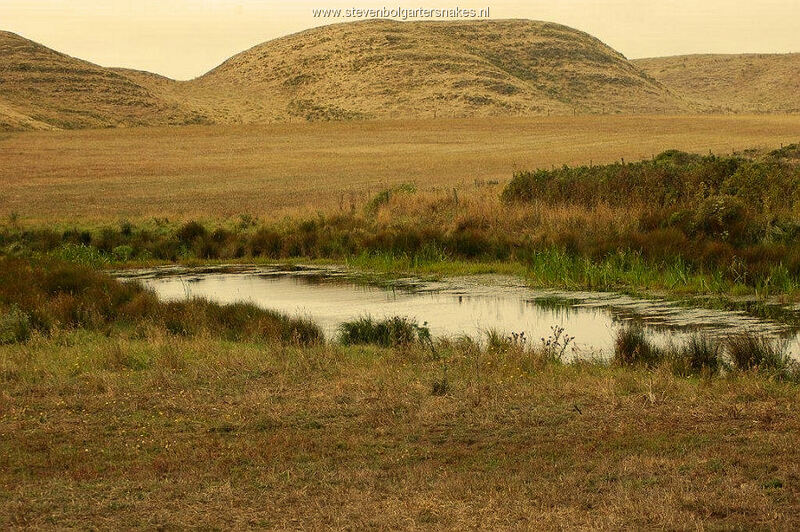 T.s.infernalis occurs in this habitat together with T.atratus ( a hybrid population) and T.elegans terrestris. So keeping these 3 species of Garter Snakes combined in a large terrarium is in line with how it is in nature. My article about Breeding and care in captivity of the Santa Cruz Garter Snake can serve as a general guideline how to keep T.s.infernalis. 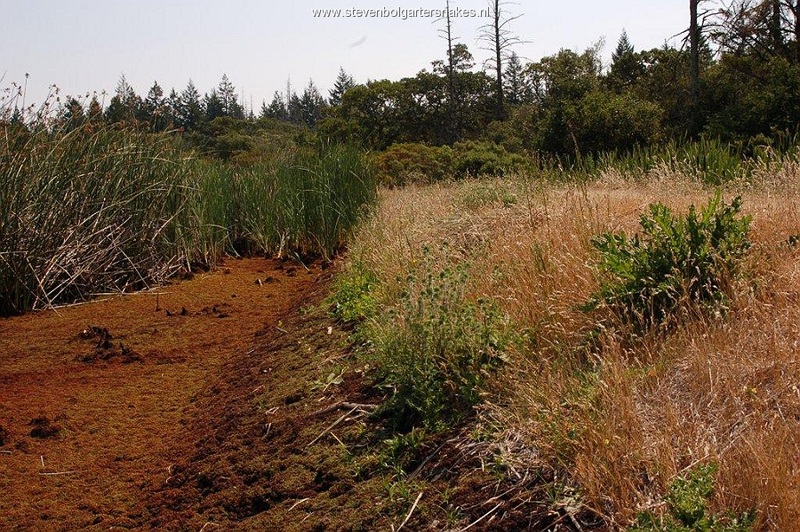 Natural habitat of T.s.infernalis in Sonoma County. My snakes originate from 2 different populations and are kept as separate breeding groups. 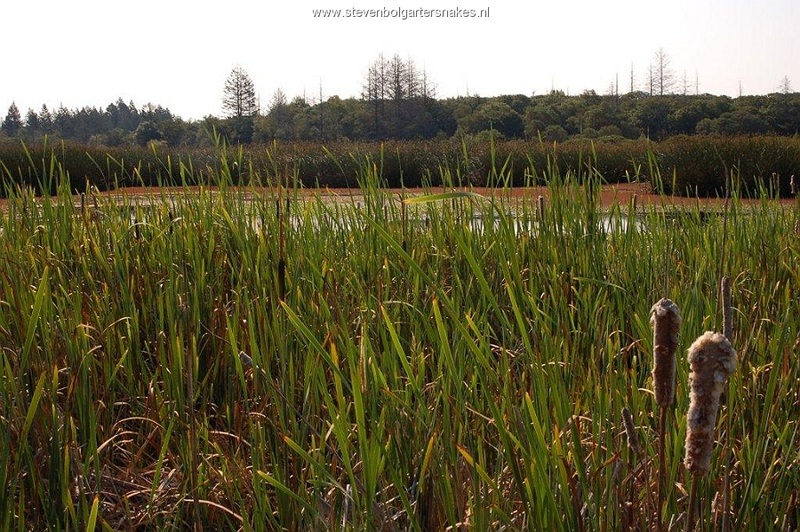 One breeding group originates from a population that lives in a remote marsh in the hills of Sonoma County, about 100 km north of San Francisco. This marsh (altitude appr. 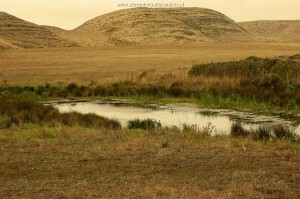 360 meter above sea level) dries up completely in late fall so no fish occurs in the water. 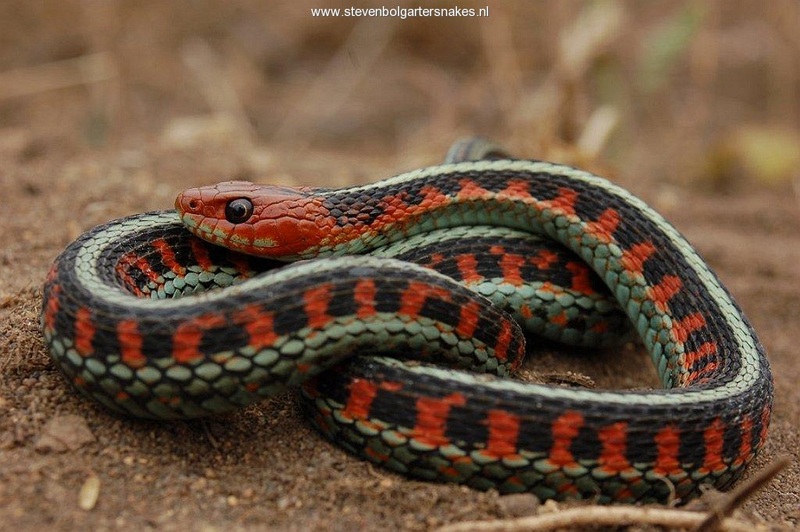 The snakes predate predominately on amphibians like the famous Red-legged Frog. Most specimens of this breeding group develop blue stripes at later age, but some retain the yellow stripes throughout life. They have a high proportion of red, but the contrast between the red and black is not so prominent. The Marsh in Sonoma County is also the home of Thamnophis atratus. 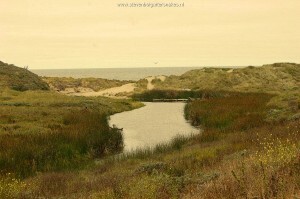 The second breeding group originates from a population that lives in the coastal dunes of Marin County, approximately 60 kilometer north of San Francisco. 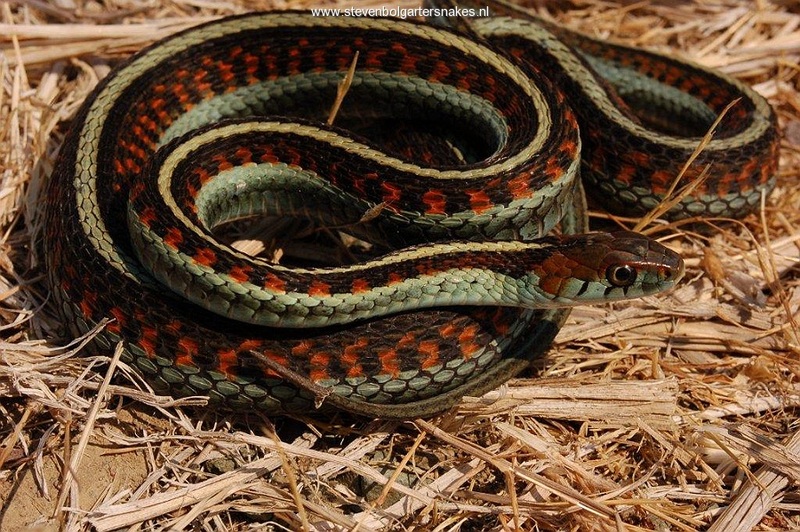 The snakes have a very vivid pattern of bright blue stripes on a clear black and red pattern. For those who like vivid and bright colors the Marin County infernalis are absolutely the most beautiful ones. They occur at sea level, less then 100 meters from the ocean, in swamps, little streams and lagoons on sandy soil. My breeding groups consist of (offspring of) appr. 10 unrelated wild caught specimens so I have captive bred snakes which are not related and less chance of inbreeding. So perfect snakes for setting up a breeding group. 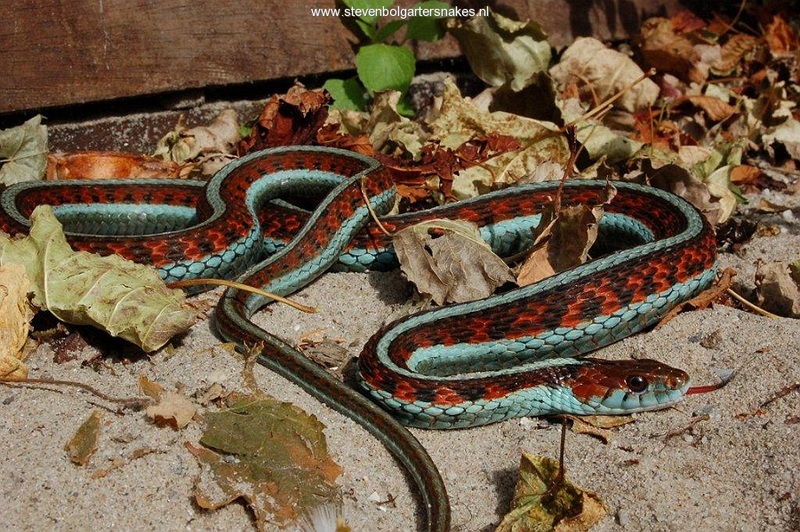 This is an advantage when comparing infernalis with the closely related and also breathtakingly beautiful T.s.tetrataenia where all European snakes originate from a few specimens from the Blijdorp Zoo in Rotterdam and a few other European zoos. 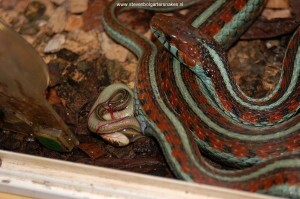 T.s.tetrataenia is now already bred for many generations without any “fresh snakes”. 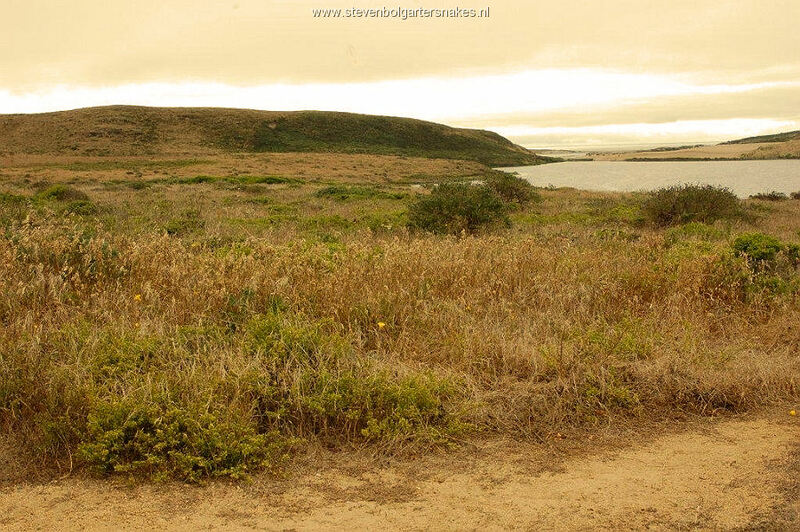 Looking at the low number of snakes that still live in the wild in California it is very unlikely that any new specimens of tetrataenia will ever make it to Europe. Just as T.s.concinnus juvenile infernalis are born with only some faint colors. 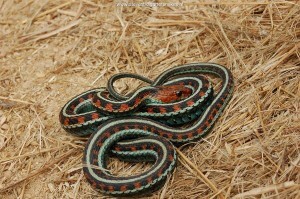 After several sheddings the colors get brighter and brighter and the snakes get more and more red. Also the stripes lack the blue coloration after birth. At birth they are more yellow then blue and they get more blue the older the snakes get.